Ensure you are staying up-to-date on the latest trends within human capital management (HCM). The world of HR, payroll, and talent management is constantly and rapidly changing. That's why Ultimate Software’s experts are constantly monitoring headlines for anything that can pertain to you or your organization. 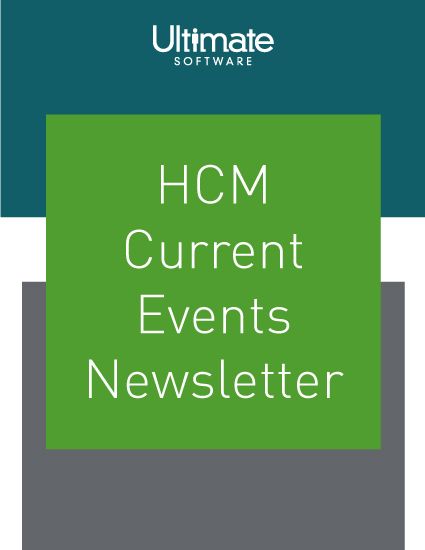 Our quarterly HCM Current Events newsletter breaks down the latest trends happening within HR and payroll to help make sure you and your organization are prepared and alert. By subscribing to our HCM Current Events newsletter you can stay on top of news and regulatory updates affecting the human resources field, and use these trending headlines as opportunities to implement new processes or refine your existing ones. Please fill out this brief form to join our newsletter on current HCM topics.